The angel yawned, the king crossed his eyes and stuck out his tongue. Mary's frustration showed on her face as she held the squirming baby and popped a bottle into his mouth. Joseph wore a Mariachi uniform topped by big sombrero. At his feet, a bottle of tequila. The Church was alive this Christmas Eve. Mexicans and gringos alike entered the walled courtyard and made their way around the parameter to see the living nativities. Conceived and constructed by the various neighborhoods of Ajijic, children performed the central rolls of Mary, Joseph and an assorted cast which included angels, babies, wise men (or not), toy animals, and a couple reindeer for good measure. After an hour or two of posing, some actors continued to appear reverent as their photos were taken, though boredom showed on a few faces. One living baby apparently got cranky and was removed, only to be replaced by a hat. 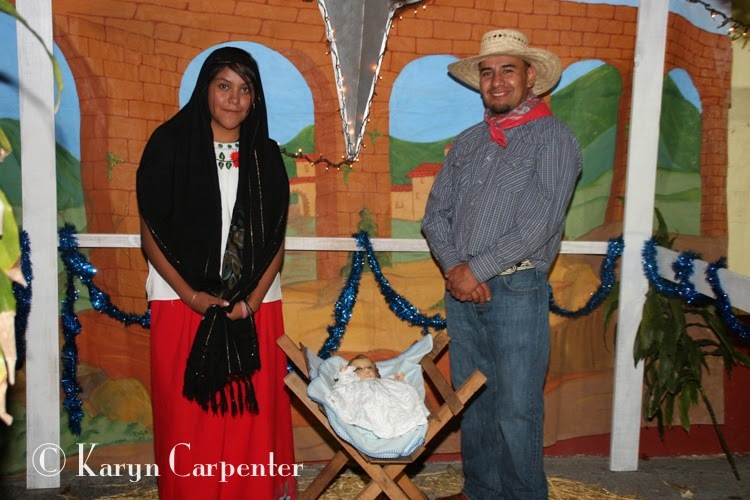 One scene portrayed Mary and Joseph dressed as peasant Mexicans. 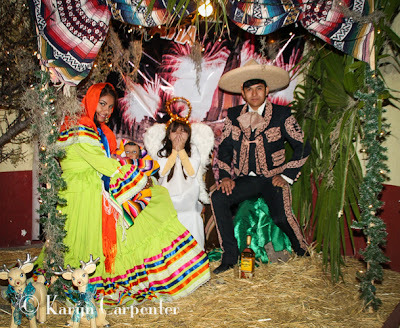 Another rendition of the sacred scene was played out by Mary in bright colorful Mexican party wear with yards of skirts, ribbons and a bright orange headdress. She seemed to be the happiest Mary - perhaps because her Jesus was made of wood and wasn't putting up a fuss in the cool Mexican night air. Or maybe she snuck in a sip of Joseph's tequila! In the center of the church courtyard, a huge piece of art had been constructed of colorful saw dust, depicting a bright red and green poinsettia on a beige backdrop. Words at the bottom proclaimed "Feliz Navidad 2014". Mary, Joseph and the baby Jesus, Mexican Style! As a series of bells rang, the faithful made their way through the giant doors of the old stone church for Midnight Mass. The priest, once young and energetic, has seen a few Christmas Eves, and with age comes wisdom - or perhaps a desire to hit the hay early. Through the years, Midnight Mass was moved to 11, then 10, and now is held at a more practical hour of 8. Curious, I followed the crowd and stood at the back of the sanctuary. The building was filled to capacity, yet people continued to push through the doors. I realized I was depriving someone of space within these walls for whom this service carried great meaning, so I made my way back outside and left the faithful to worship on this Christmas Eve.